July | 2012 | ride. travel. live. The so-called Jewel Boxes are all late works of Louis Sullivan, who struggled to get commissions after the end of his partnership with Dankmar Adler in 1895. 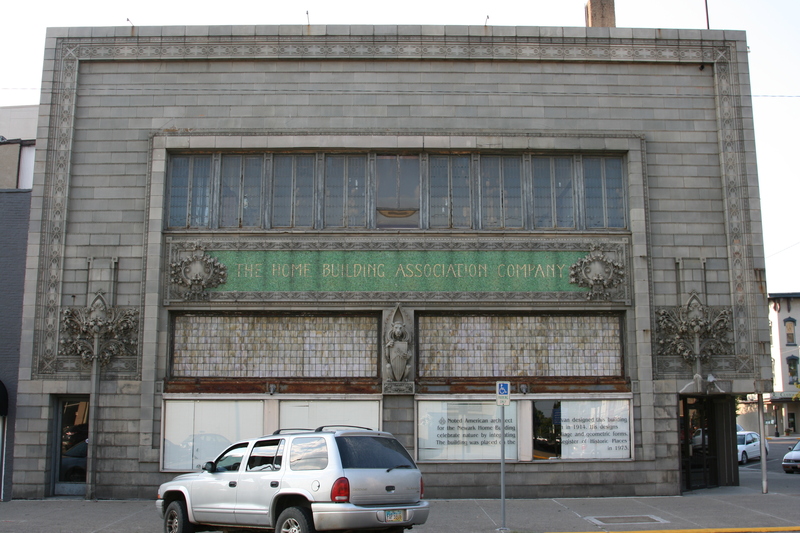 Between 1908 and 1919, he received eight commissions for small bank buildings, scattered over five states in the Midwest. All of them remain today, in varying states of repair. I had the chance to tour all of them recently, and will try to put together a few blog posts on the buildings. 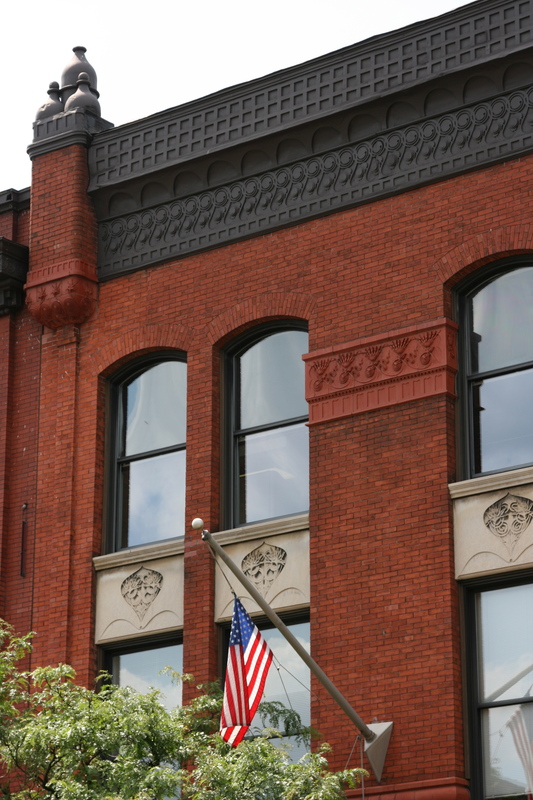 His Home Association Building in Newark, Ohio, known as ” The Old Home”, was built between 1914-1915, and occupies a narrow, though prominent corner site opposite the town square and county courthouse. The building stands out as being quite unlike the other seven Jewel Box bank structures. 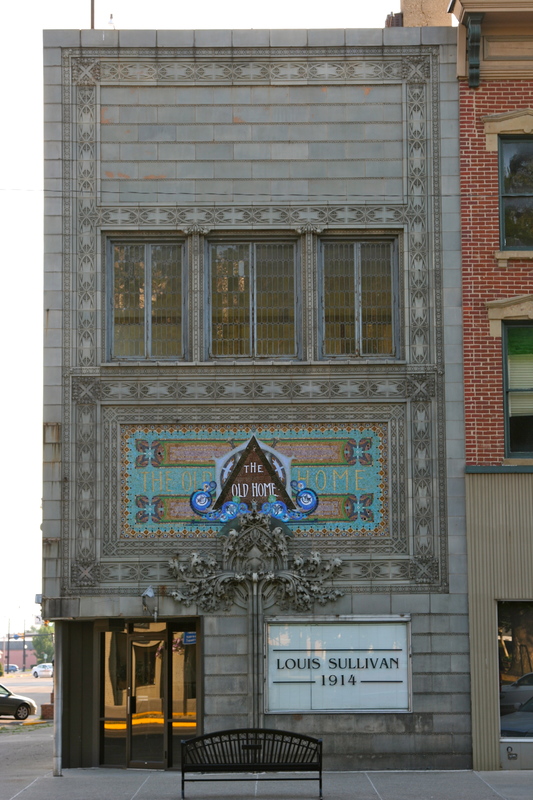 Sullivan’s choice of materials was unusual, clad in gray terra-cotta, with liberal use of mosaic, in contrast to the red brick of his other designs. The pattern of decoration, however, is signature Sullivan, with his characteristic plant forms and blooming ornament, and the presence of the gryphon creatures that look over some of his other Jewel Boxes. The structure has been significantly modified over the years, with signs covering the two mosaics on the long south facade and on the smaller east facade, and a great deal of damage was done in the 1940s when a corner entrance was carved out of the south facade, destroying the symmetry of the south facade. South facade, note the corner entrance. The building has gone through its life as a bank, butcher shop, jewelry shop, ice cream parlor, and now is apparently a residence on the top floor and vacant at ground level. I went by it in July 2012 and noticed that the lights were on upstairs, though the ground floor windows were covered up. The mosaics are again visible, but there is noticeable damage to certain areas where signs had been once mounted. 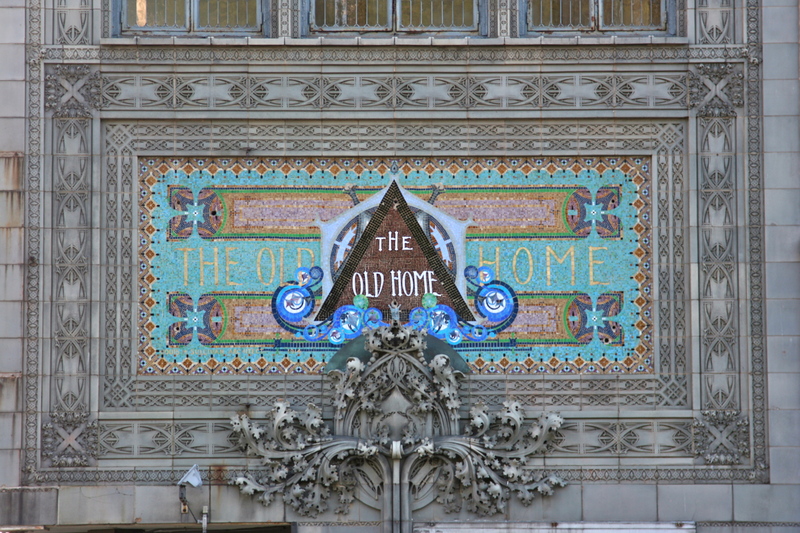 The mosaics have a color scheme that is almost psychedelic, integrated with Sullivan’s acanthus leaf motifs. 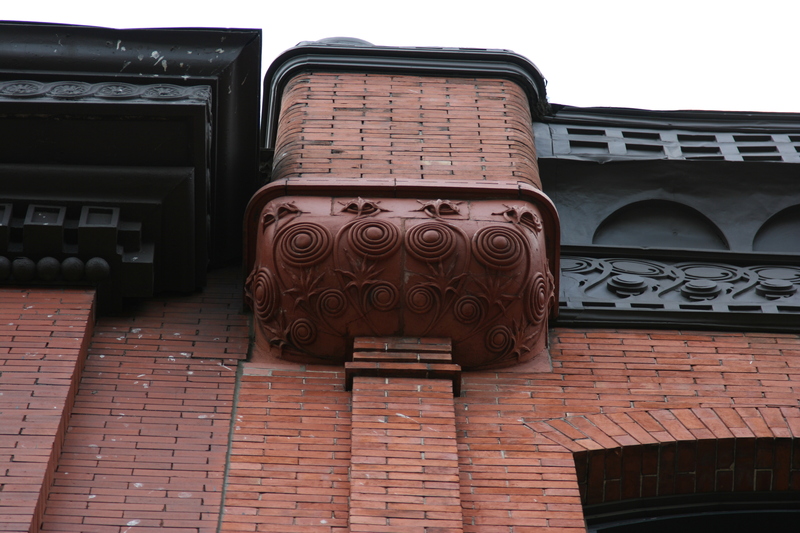 The terra cotta panels are falling apart in places, and some of the steel is exposed and rusting. The stained glass windows on the second floor appear to be in good condition. I was not able to tour the interior, but old photographs show that it was a marble-clad banking hall with intricate stenciling and rich decoration. 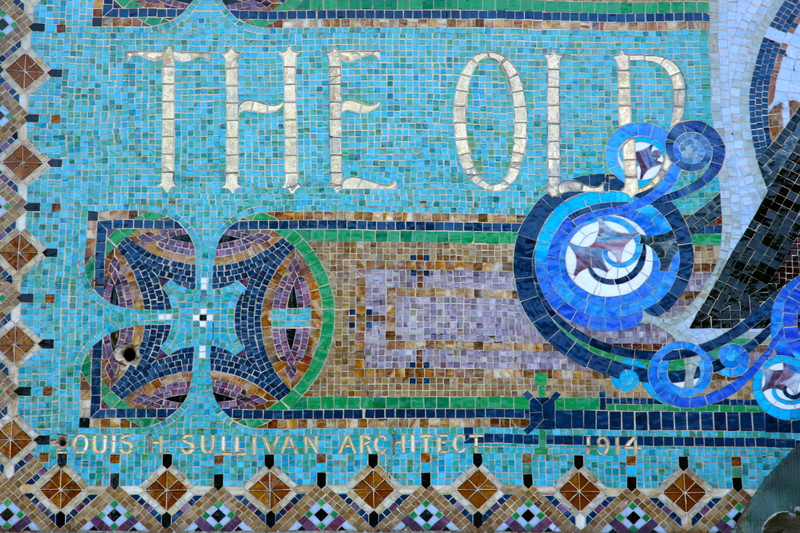 Mosaic detail, note Sullivan’s name in there. It’s a jewel in the rough; let’s hope the current owner is able to bring back some of its former glory before the building deteriorates further.